Rainbow Rabbit Educational Services Corp. has received its second major grant in as many months. This time, the contributor is Wegmans, one of the most successful and biggest food market chains on the East Coast. Easter 2018: Rainbow Rabbit Sends His Best Wishes! Rainbow Rabbit is Celebrating Easter! 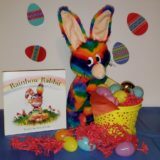 While the Easter Bunny prepares for his big day, Rainbow Rabbit is also hard at work spreading messages of kindness, while bringing/hiding some Easter eggs to boys and girls everywhere who have shown exemplary behavior—specifically acceptance, tolerance, unity, and inclusion towards others. In honor of National Nonprofit Day, Rainbow Rabbit is proud to announce that it has officially established its organization as a 501c3: Rainbow Rabbit Educational Services Corp. Happy July 4th Wishes From Rainbow Rabbit & Friends! Rainbow Rabbit is celebrating July 4th! July 4th is known as Independence Day, the day when the Declaration of Independence was adopted by the Continental Congress in 1776. John Adams and Thomas Jefferson were two of the signers of the Declaration of Independence, and they later became Presidents of the Unites States of America! As you all know, most Fourth of July holidays are celebrated with barbecues, concerts, baseball games, parties at the beach, picnics and other festivities including speeches from politicians or dignitaries. Rainbow Rabbit is celebrating too, and behalf from all of us, we all wish you a safe and happy holiday! Remember, Summer, Fall School Programs Are Now Available From Rainbow Rabbit!